We explored the Chinatown district of Singapore today, stopping at various temples and the many food offerings at the stalls. Among the bustling of the vendors, the newer tourist restaurants and bars and the preparation for Chinese new year, a very human element to the shiny new high tech Singapore is still in abundance. This shot was taken at a Hindu temple in Chinatown. Nice color saturation and dof. Enjoy your travels! 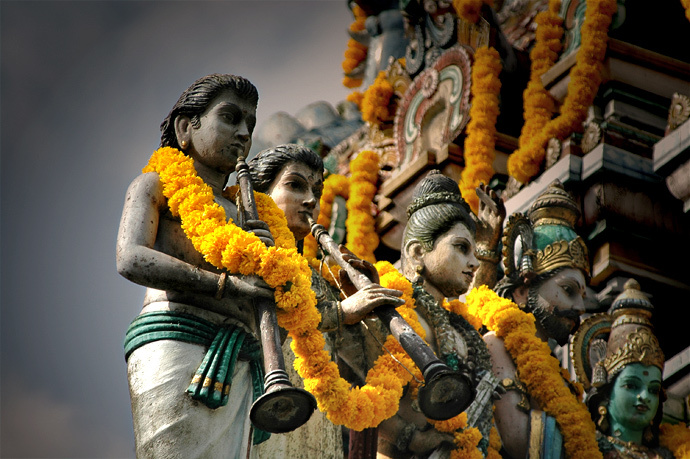 An awesome photo on details of a Hindu Temple. Very well executed!